If you have questions about the movie, Robosapien Dance Machine or anything else related to the Robosapien, Robosapien V2, Robopet or Roboraptor robots, visit the EvoSapien Forum. I have made a new video to show some of the capabilities of the new, upcoming version 3 of Robosapien Dance Machine, the free open source program that lets Windows PC users create complex scripts to control their robots, and control their robots using just their voice. This 1 minute 3 MB video demonstrates the support that version 3 of Robosapien Dance Machine will have, for all of WowWee�s robots; including the Robosapien V1, Robosapien V2, Robopet, and Roboraptor robots. 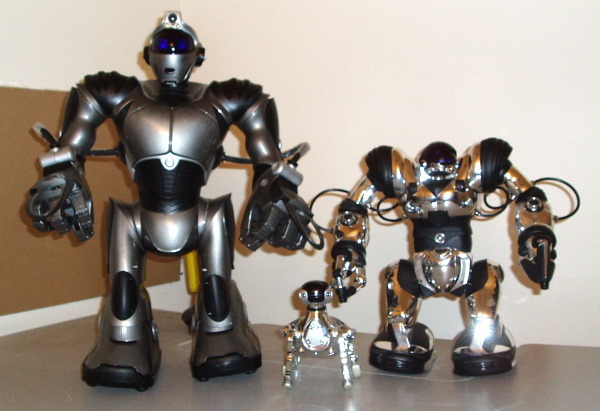 The currently available version only supports the original Robosapien. To make my Robosapien robots dance and act, I needed a way to script the commands normally issued by the remote control in a much more effective and complex manner. I wrote a piece of software, The Robosapien Dance Machine, to give me full script editing capabilities. In essence it is a word processor for Robot control. With the addition of an adjustable WAIT command and creative use of the Robosapien STOP command, I was able to synthesize new movements that timed well to a 120 beats per minute song. I used the UIRT, a USB driven infrared transceiver made by Jon Rhees, to control my robots from my PC without the need for the remote control. Below is a screen shot of the main screen. The software is an open source project hosted on SourceForge. SUBSCRIBE to The Robosapien Dance Machine newsletter. (tm)! If you want to be notified when we have new videos or about other important information about Robosapien Dance Machine and WowWee�s robots, use the subscription form on the left.